The Colville River Unit (commonly referred to as Alpine) is located in the Colville River Delta on Alaska’s western North Slope, 34 miles west of the Kuparuk River Field (Kuparuk) and eight miles north of the Inupiat village of Nuiqsut. More than eight years of environmental studies guided conceptual development of the field, allowing engineers and environmental experts to locate drill sites and facilities in areas where they have had minimal impact on wildlife, waterfowl and the subsistence lifestyle practiced by Nuiqsut residents. Field construction and development took three years, six million man-hours and cost more than $1.3 billion. Alpine has no permanent road connecting it to other North Slope infrastructure, therefore, in the winter, an ice road is built connecting Kuparuk to Alpine to move in supplies for the rest of the operating year. In any given winter season more than 1,500 truckloads of modules, pipeline and equipment are moved to Alpine over the ice road. 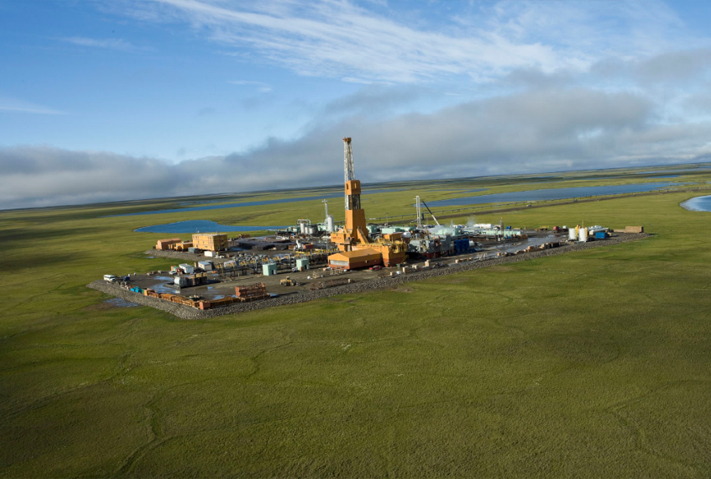 Alpine was the first North Slope field developed exclusively with horizontal well technology to access greater than 50 square miles of subsurface from a single drilling pad. It also employs Enhanced Oil Recovery (EOR) through waterflooding and miscible gas injection. Its one-day production record was 139,000 barrels in 2007. The original Alpine facility was planned as a 97-acre surface development that included stand-alone processing facilities (CD1), a second drilling pad (CD2), and an airstrip/3-mile gravel road connecting the two pads. That original development accessed about 40,000 acres of subsurface area from the original two drill sites. With additional satellites, the total surface development now encompasses about 165 acres. The first two Alpine satellites – Fiord (CD3) and Nanuq (CD4) – came on line in 2006. CD3, three miles north of the main Alpine facility, is a roadless drill site with an airstrip and has winter-only drilling via an ice road. CD4 is four miles south of the main Alpine facility and is connected by a gravel road. These two satellites represent approximately $500 million in investment. In July 2008 another oil pool, Qannik, began producing. The Qannik development is an extension of the CD2 drill site two miles west of the main Alpine processing facility. Over 450 million barrels have been produced from the Colville River Unit. After processing, the sales-quality crude oil from Alpine moves to market through an elevated 34-mile, 14-inch pipeline connecting Alpine to the Trans-Alaska Pipeline System via the Kuparuk Pipeline System. In December 2011, the U.S. Army Corps of Engineers granted a permit allowing development of CD5, an extension of the Alpine field, to proceed. Terms of the permit were incorporated into the project plan, and the Alpine West/CD5 Project was sanctioned for funding in October 2012. In October 2015, ConocoPhillips Alaska announced first oil at its long-anticipated CD5 drill site, which is situated within the boundaries of the NPR-A on land owned by Kuukpik Corporation, the village corporation for Nuiqsut, with mineral rights owned largely by Arctic Slope Regional Corporation. In April 2016, ConocoPhillips Alaska announced the approval of funding for additional wells and associated on-site infrastructure. The additional wells and infrastructure will bring CD5 to its full design and permit capacity. CD5 is exceeding its original production target of 16,000 BOPD gross, and is currently producing approximately 37,000 BOPD gross average, year to date. In addition to the production drill site and on-site facilities, the project includes a 6 mile road, four bridges, 32 miles of pipelines, and miles of communications and electrical infrastructure that tie CD5 back to the main Alpine facilities. Oil from CD5 is sent back to Alpine CD1 for processing before it is sent through Kuparuk to the Trans-Alaska pipeline. CD5 represents a total project investment of more than $1 billion (gross).